Can be used with gas or wood fireplaces. This produce has been made in America since 1979. Get Pennsylvania Firebacks contact information plus see product stories we've published about the company. 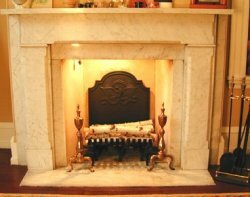 When homes were heated with open fires, no self-respecting fireplace was without a fireback. In addition to protecting the rear wall of the firebox, a fireback also retains and radiates heat, increases heating efficiency. And they're pretty, too. Just slip this embossed cast iron plate into the back of your existing masonry fireplace. The project might require a strong back (or a strong friend to help). A fireback weighs 30 to 60 pounds. Choose from more than 30 designs, and a wide variety of sizes.